Fits the Mercury/Mariner V-200 Pro XS, DFI (3.0L) OptiMax outboard, 1B912786 & above. Compatible with exhaust tube 833116A19. 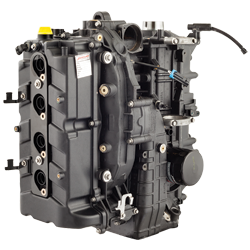 Remanufactured outboard powerhead, 100% new dress parts. 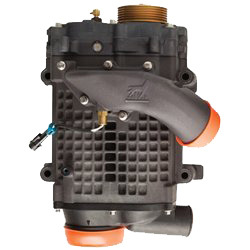 Direct Fuel Injection Technology. 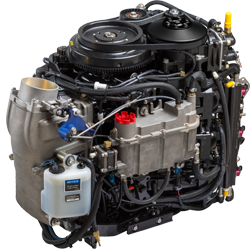 Fits the Mercury/Mariner V-225 Pro XS, DFI (3.0L) OptiMax outboard, 1B973744 & above. Compatible with exhaust tube 8M0075819. Fits the Mercury/Mariner V-250 Pro XS, DFI (3.0L) OptiMax outboard, 1B973744 & above. 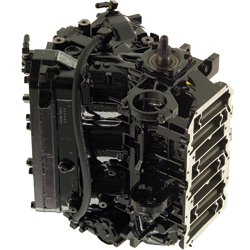 Remanufactured outboard powerhead, 100% new dress parts. Direct Fuel Injection Technology. Compatible with exhaust tube 8M0075819. 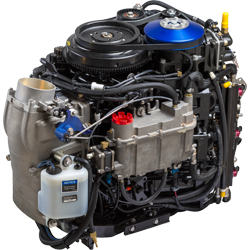 Fits the Mercury/Mariner V-300 Pro XS, DFI (3.2L) OptiMax outboard, 1E052058 & above. Compatible with exhaust tube 833116A14. 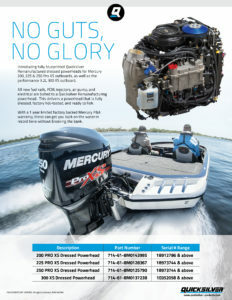 Introducing Quicksilver fully dressed remanufactured powerheads for Mercury outboards. A fully dressed powerhead minimizes cost, reduces installation time, improves reliability, and has customers ready to fish in record time. 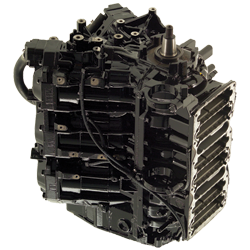 100% new dress parts such as: plenum, TBU, sensors, calibrated fuel rails, alternator, VST, injectors, air pump, and electrical are installed onto a factory remanufactured powerhead from Quicksilver. A new PCM is set for the break-in period, and the full assembly is factory hot tested prior to shipment. For best performance, inspect the old exhaust tube prior to powerhead installation to verify it is not plugged nor corroded. There are no core or container deposits with fully dressed powerheads! With a 1-year limited factory backed, Fully Dressed Powerheads get you back on the water in record time without breaking the bank.